The Coralville Police Department is asking for assistance in identifying the female pictured in the photos below. 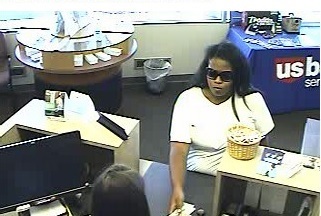 She is wanted for questioning regarding a robbery from US Bank, 506 10th Ave. on 08/05/2016 (C16002544). 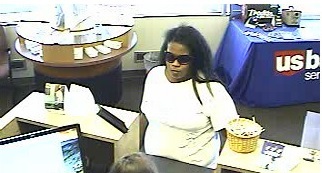 A lone black female entered the bank and handed the teller a note before leaving with an undisclosed amount of money. 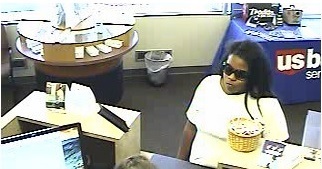 The suspect is described as a black female, approximately 6’00 and weighing 200-250 pounds. She has long, black wavy hair. The suspect also has a tattoo with unknown wording on her left forearm. The suspect was wearing a white t-shirt and blue scrubs. The female left in an older model, gray or beige colored vehicle driven by a black male wearing a gray colored shirt.